The FBI now joins the list of other government agencies, running large fleets of aircraft over U.S. cities. The FBI has been busted running over 100 domestic flights, for the purposes of mass surveillance over U.S. cities including: Minneapolis, New York, Chicago, Phoenix, and Seattle. The planes are registered to dummy corporations and cutouts with names like: NG Research, FVX Research, and KQM Aviation. The original investigative leg-work was done by regular people on the internet, who had noticed small planes flying overhead during the recent riots in Baltimore. The AP has now "officially" broke the story, so you can talk about it with your friends, it's not some crazy conspiracy anymore. Of course the AP only dug into one hub, Bristow, VA, for these aircraft, so the story continues to widen. I will keep this topic updated as things progress. - April 11, 2003. FBI admits to flying a spy-plane over Indiana University, searching for terrorists, despite no terrorist threat being identified at the University. Source. - May 31, 2005. New York Times runs an article with some details on how front companies and cutouts are used to hide CIA airplanes. Source. - June 2006. A report from WIRED Magazine details an unusual small aircraft circling Lodi, California. The cutout Northwest Aircraft Leasing Corp. in Newark, Delaware, was fingered as the owner. The report speculates that the plane is being used by the FBI for surveillance. Report also states that as far back as 2003, the FBI admitted to flying Cessna 182's in America for surveillance purposes. Source. - February 5, 2014. A report detailing "persistent surveillance systems" is run in the Washington Post. It details the ability of surveillance devices attached to small planes to watch everyone and everything in a 5x5 square mile radius. The report nails several instances of the use of these planes. Source. - May 9, 2013. In the wake of the Boston Marathon bombing, mysterious planes are reported flying over Boston and surrounding areas during the day and night. Source. - May 10, 2013. One of the spy-planes flying over Boston is identified as N906TM, registered to RKT Productions in Bristow, VA. Source. - July 23, 2014 - Reddit user jeandubrulee posts a comment about a mysterious airplane constantly circling over the McLean/Langley area in Virginia. The plane is identified as N539MY, belonging to NG Research. Source. - May 2, 2015. Tweets regarding a mysterious plane circling over the riots in Boston get the ball rolling. Plane is identified as N539MY, belonging to NG Research. Source. - May 5, 2015. FBI admits that spy-planes were "provided" to law enforcement in Baltimore in the wake of rioting to "[provide] aerial imagery of possible criminal activity." Source. - June 2, 2015. AP blows the story into the mainstream. Links FBI to dozen shell companies. FBI asks AP not to publish story for ludicrous reason that it "would saddle taxpayers with the expense of creating new cover companies to shield the government's involvement, and could endanger the planes and integrity of the surveillance missions." One Robert Lindley is linked as the CEO of NG Research. Source. - Look up Plane Call Signs (N-Number). - ACLU story about why this type of persistent, wide-area surveillance is dangerous. Source. - List of 115 spy-planes with links to their flight paths so you can track. Source. - NSA whistle-blower Bill Binney thinks that the FBI spy-planes could be part of TREASUREMAP, an NSA program to map the internet and create a profile of everyone in the world. Source. - Planes with JENA call signs are still operating around the phoenix area. Source. - Chaparral Air Group in Texas coming under scrutiny as potentially operating a spy-helicopter. Source. TRACK 115 FBI SPY-PLANES USED IN THE U.S. Here is a table of 115 FBI domestic spy-planes, with their registration and links to flightradar24.com, where you can track their flight paths. I live in Phoenix and my coworker was telling me she's been noticing this plane circling around their neighborhood the past 12 days. They started tracking the planes on Flightradar24 and she sent me these screenshots of some of their flight paths: http://postimg.org/image/tpdhpd789/ http://postimg.org/image/o2h4rw4pl/ http://postimg.org/image/uuc58hj2x/She even had a pilot friend go down to the airport that they've been flying out of and do some snooping. He found took this photo of the camera equipment mounted to the bottom of the plane: http://postimg.org/image/hm861sw61/She said that it's always the same 3 tail fin numbers which take turns doing the same flight path. They start at daybreak and only stop late in the night. Senate Judiciary Committee Chairman Chuck Grassley (R-Iowa) is pressing the FBI for answers on mysterious surveillance flights the agency conducted in cities across the United States. In a letter to FBI Director James Comey on Monday, Grassley asked about the legal authority, and the scope and purpose of the flights. He also wants to know what kind of technology the flights are carrying. His request came only hours before an Associated Press report Tuesday morning detailed more than 100 such flights around the country in the past few weeks that can be traced back to fake companies set up to disguise the FBI's involvement. "It?s not a secret that the FBI is operating in the skies above our nation?s cities and towns, but what?s unclear is precisely what the Bureau is doing and what legal framework is being used to guide its activity," Grassley wrote in his letter. Most important thing to take away is that THERE IS NO WARRANT! Somehow that doesn't seem to jive with the FBI's own rules for surveillance.
" A strange invader roamed the skies over Indiana University at Bloomington in February: a white, single-propeller Cessna 182 that circled for hours on end. The airplane buzzed the city for more than a week, at noon, in late evening, and after midnight. Watchers craned their necks in curiosity -- and apprehension. What was it doing up there? The answer was simple, if bizarre. After first denying any connection to the flyovers, officials at the Federal Bureau of Investigation confessed that they were using the plane to conduct visual surveillance of the campus as part of the fight against terrorism. They had identified no terrorist threat against the university, but the agency said it was watching specific individuals, vehicles, and businesses, particularly those that sent faxes or e-mail late at night. Agents had also interviewed several international students on the campus. FBI activity has increased at colleges and universities since the September 11 attacks and the passage of the USA Patriot Act in 2001. Incidents like the one at Indiana are occurring with more and more frequency across the country, often with foreign students and scholars as the targets. On February 26, agents from the FBI and other federal law- enforcement authorities stormed the University of Idaho, in Moscow. Dozens of agents swooped into the sleepy college town at 4:30 a.m. and raided the university's graduate-student housing. They arrested a Saudi graduate student with alleged terrorist ties and interrogated more than 20 other international students for more than four hours. That same day, federal agents arrested an adjunct professor at the State University of New York at Oswego and charged him with funneling millions of dollars to Iraq. A week earlier, federal prosecutors indicted Sami Al-Arian, a computer-engineering professor at the University of South Florida accused of helping Palestinian terrorists. A University of Central Florida professor and former student of Mr. Al-Arian's was arrested on immigration charges a month later. (All the men have denied any wrongdoing.) And last December, an Iraqi-born economics professor at the University of Massachusetts at Amherst was questioned by an FBI agent and a university detective about his loyalty to the United States." 30-year NSA veteran and whistle-blower, William Binney, talks about how the FBi spy-planes may very well be connected to NSA illegal spying programs, specifically TREASUREMAP. Could the FBI surveillance air-force be the "Geographical Layer" of TREASUREMAP? In the NSA slides, leaked by Edward Snowden, It appears as though the NSA's main mission in the TREASUREMAP program is the "Logical Network Layer," while also focusing on the "Physical Network" and "Geograhpical Layer." A Phoenix aviation photographer may have captured photos of secret FBI spy planes at Deer Valley Airport. Chris Kennedy posted photos of the two Cessna aircraft on Flickr. The registration records for the aircraft lead to two companies identified by the Associated Press as dummy corporations set up by the Department of Justice. And the spy planes appear to still be flying. All day Thursday, a Cessna aircraft was flying in circles over specific areas of the Valley. It spent more than an hour circling the area of 7th Street and Cave Creek Road, then continued on to circle the White Tank Mountains. The aircraft went by the call sign JENA24, which is rumored to be used with FBI surveillance operations, and transmitted on the same frequency as many of the other suspected FBI planes. Apparently, according to reporter William Pitts, the plane disappeared from radar while in flight and far from any airport. He speculated that it may have switched call signs. A Plane at Deer Valley Airport has been photographed with an attached camera pod, which is registered to an alleged FBI cutout. This little blip didn't really attract much attention when it was posted back in 2013, but it is coming under fire now, after recent revelations of the FBI's mass surveillance spy-plane fleet operating all across the country. 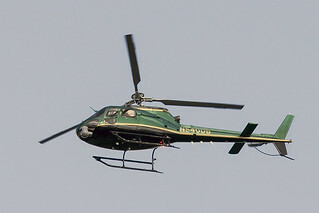 The chopper, which a commenter identified as N540DB, is registered to a Chaparral Air Group in Grapevine, Texas. The commenter alleged that it was a DEA helicopter with a green top and black bottom. A photo of the aircraft, complete with what appears to be an attached camera pod, can be found here. Chaparral was also spotted flying a Cessna in circles over Quincy in 2014. Source. In the wake of the Boston Marathon Bombings (May 2013), several planes operated over Quincy, and other areas around Boston for weeks. Here is all the info on them I could scrape up. Sen. Ron Wyden, D-Ore., and Sen. Dean Heller, R-Nev., on Wednesday introduced the Protecting Individuals From Mass Aerial Surveillance Act, which would require federal government agents to get a warrant before snooping from the sky. ?This applies to federal agencies. To the extent that a state entity would fly a drone, this bill wouldn?t address it,? said ACLU spokesperson Neema Singh Guliani. ?It is also important to note that there is a border carve-out exemption of 25 miles. For people who live within that 25 mile border zone, like Tuscon [or] San Diego, these protections wouldn?t apply. ?